The Bubbling Well Road was the road to the ‘Bubbling Well’, to Jing’an Temple, an extension of the Nanjing Road, known to Chinese residents as the ‘Dama lu’ 大马路’. Early residents of what became the International Settlement used to walk out for recreation along this route to the temple. As the settlement grew it became for a time a quiet, semi-rural residental area. It was incorporated into the Settlement in 1899. In 1919 it was the ‘prettiest road in Shanghai’, remarked the Revd Darwent, who took the photograph below, ‘the foliage is rich and full’. Bubbling Well Road, Shanghai, Hayward collection, da01-02. It was a favourite with those who liked to show off their new automobiles — evidence of Shanghai’s First World War boom — by driving up and down it at all hours. As well as the temple, it was the site of a settlement police station, and the Bubbling Well Cemetery, opened in 1898, closed in 1951, and redeveloped two years later. The present Jing’an park occupies the site. This entry was posted in Alphabet China, Digitisation, Photograph of the day and tagged Darwent, Shanghai. Bookmark the permalink. Love the photo. I am doing a little research into my family and my great grandfather lived at no. 200 Bubbling Well Road. What a fantastic name. He died there in 1909. My father worked in Shanghai between approximatley 1928 to 1932, I have some photographs, one is taken whilst he was standing on the balcony of a house that he rented in Bubbling Well Road lived. I can remember him telling me many tails of his escapades during his stay there, gambling at the Canidrome etc. My grandfather built and operated the sixty room Bickerton Hotel at 102 Bubbling Well Road (1900-1925) in Shanghai, China. His name was Thomas Lacey Bickerton married Wilhelmina Paisley (Bickerton) We have many photographs of Shanghai. He was also involved in the Chinese Labour Corp (1915-1919). They moved to Tsingtao in 1926 living happily at Strand Beach. They were interned by the Japanese – POW camp from 1943 to 1945. My great grandfather (William Henry Talbot) lived in China and my grandmother (Amy Talbot 1890-1984) was born on the 20th September 1890 and raised in Bubbling Well Rd. He He, Chufew. William Henry Talbot was involved in banking in Shanghai and later, Yokohama, Japan. Amy Talbot was the youngest of 5 children to William Talbot and Ann Walker. They were Mary; Alfred; Dora; Vivian and Amy.My great grandmother Ann Walker Talbot doed in childbirth in 1890. If you have uncovered information about this family, I would appreciate you getting in touch. Interesting, I was looking for a photo of the actual Bubbling Well in Shanghai which was on Bubbling Well Rd. across from the cemetery where our grandmother was buried. Our father was born in Yokohama, mother from Vladivostok…all four of us were born in Shanghai…my brother, sister, aunt and father were interned in Chapei Camp. We arrived in SF in 1947. My husband and I wrote a book called ‘Now is the time we must be strong’…..and it’s on Amazon or we have some here to sign, etc. I am Amen Roth ,Doris Roth is my haldblooded sister,I am still living shanghai,I am luck I can look ‘Now is the time we must be strong’ the book in my life! I have a photo of my grandfather and his friends from when he lived and worked at 99 Bubbling Well Road. His name was Dr. Raymond Louis Carey. My family – (both sides of grand parents) were in Shanghai before the war and they all ended up in Chapei POW Camp. My parents were children – Mum born in 1932 in Hong Kong and Dad born in 1929 in Shanghai. My paternal grandparents were missionaries and were based in Bubbling Well road where I believe the Chinese Inland Mission had their Shanghai office. My maternal Grandfather was a Customs Officer with the Chinese Maritime Customs. I am also researching my family history – and would love to hear from people whose families shared a similar fate. I still live in Hong Kong. My grandmother Mrs Julie Paton used to stay at Arthur and Bessie Hallams residence in this road in 1922. She had four daughjters ,one of which was my mother Eileen Patricia Paton Clifford nee Paton ,born China 1015. Died Perth west Australia 2007. Thank you Robert…I will be there next week….checking out the life and times of Samuel and Frances Clifton and their daughter Bertha Limby. My aunt died of smallpox in Shanghai in the late 1920’s.She died in the isolation hospital which I think was in Bubbling Well Road.I was in Shanghai about 5 years ago but could not find find any information about the hospital although I could see where the old racecourse had been in that part of Shanghai.Does anybody know anything about the hospital ? Suzanne – The Municipal Isolation Hospital was north of Suzhou Creek at 41 Range Road (now Wujin Road) . It was across the street from the Japanese School and in the block west of Hongkew Creek. I have a 1937 map of Shanghai and it has been amazingly useful for just such as this. My great grandfather was Star Talbot, married to Emily (nee White). He was Eurasian and his Chinese name Sze Yuen Ming. 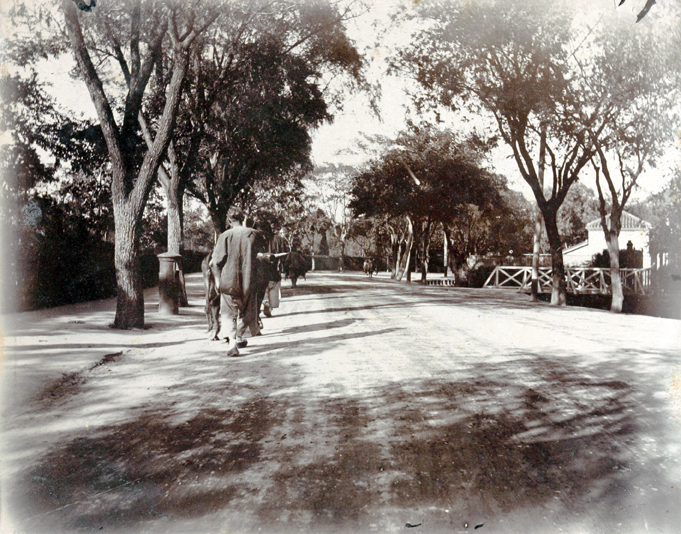 They lived on Bubbling Well Rd, then later on Great Western Rd (and Tifeng Rd). Emily’s father was bullion broker Augustus White. His father was London banker Augustus Jackson White. Augustus White remarried after the death of Emily’s mother and had more children, including Ethyl Bidwell (nee White). If anyone has information about them, I would appreciate hearing from you. My parents met in a sweet shop in Bubbling Well Road in 1935. I am going to Shanghai on Wednesday. How do I find Bubbling Well Road today? Bubbling Well Road is Nanjing xi lu, that is, West Nanjing Road. Kathryn, you are definitely related to me as Amy Talbot was my grandfather’s sister. I wrote a note on this site, but haven’t heard from you. I have a significant amount of info about the Talbots who lived in Yokohama and Shanghai and also some info about Anne Walker, our great grandmother. Please contact me. My email address is: katetb@aol.com I live in the US. I look forward to hearing from you. I am looking for information about my husband’s grandfather. His surname was Kardos (formerly Cohen) (my husband does not know his first name – only that he was ‘papi’) and I understand that he had a menswear shop on Bubbling Well Road from approx 1938 to 1948. If anybody has any information (including a map of the road at that time) I would be most appreciative. My email address is susicurtis1@hotmail.com. This blog has generated a lot of interesting comments. However, we are shutting down the comments function on this site overall. If you have comments and queries about the Bubbling Well Road we would be happy to hear from you direct via hums-chinaphotos [at] bristol.ac.uk. My great great grandfather lived at number 59 Bubbling Well Road in the early 1900s, until 1919, I think. It’s so beautiful. Looking for any information on my maternal grandfather, Henri Albert du Pont, he was involved with the building of the French Concession and died around 1926 in Shanghai and was buried at Bubbling Well Cemetery. My grandfather was Belgian French and was on assignment as a diplomat. He married my grandmother Anastasia (Russian descent) around 1924 in Shanghai at the Catholic church. When they had my mother Josephine Therese du Pont, the French Embassador was the godfather. Have not had any luck locating any newspaper articles of the wedding, birth, baptism or death records. My great-grandad, Frank Learner Rodgers, moved to Bubbling Well Road with his family in 1903 when he was 34. His wife was Anna Harmon Rodgers, age 31, and children were Frank Wallace Rodgers (age 7) and Isabelle Harmon Rodgers (age 5). Frank was good friends with American Ambassador Edwin Conger and wife Sarah Pike Conger. He ran a business called The Getz Brothers, a wholesale provisions company out of San Francisco. He had a business partner whose last name was Tuttle. In 1904 he got very sick and died in the Shanghai hospital. After his death his wife Anna opened a business making hats. She and her children, at that point, were living with the Lewis family. I was curious if any of these names ring a bell to anyone. My Grandmother Vera Newcomb was born in Shanghai in 1892 and lived in Bubblingwell Road with her sisters, Eileen and Hilda and her brother Cyril. Her Father Frank Newcomb was a ships Captain for Butterfield and Swire and rang ships up and down the Yangtze River. Her Mother Lucy Stone was from New Zealand. The three sisters ran a drama and dance school. My paternal Grandfather Sidney Fenton also worked for Butterfield and Swire in Shanghai and knew the Newcomb family well. Has anyone been to Bubblingwell Road recently or if indeed it is still there? My great uncle, Reggie Mein -Austin, was buried in Bubbling Road cemetery in 1934. He was a director of Jardine Matheson in both Hong Kong and Shanghai and lived at Route Boisse-zon. I have a few newspaper cuttings from the time. We visited Shanghai a few years ago, but no trace of the cemetery now. He died suddenly at the age of 46 of pneumonia. My grandparents, Frank Henry Brigg Harmon and Marjorie Porteous Harmon were interned at Chapei Camp also. My great grandfather Frank Harmon was a missionary in China from 1882. He served the Chinese Labour Corps in WW1 when he was 62 years old. He was also present at the relief of Peking. I would love to see photos of China at this time. My neighbor, Frank Maselskis, served in the Marine Corps and was in Shanghai for a period or time before WWII. He was in charge of the social club (officers or enlisted men, I’m not sure which). Anyway, I hear the repeated stories and now I can tell him it is Nanjing Road? Well, Bubbling Well Road was certainly more fantastical. He wants to go back at 94. What is it like now? Would the trip be worth it in terms of connecting with ANY memories at all? My Grandfather Patricio C. Perez died in Shanghai on August 18, 1921 and was buried in Bubbling Well Cemetery. My grandmother was pregnant and gave birth to my father Tomas C. Perez there in Shanghai after my grandfather passed away. Are there any records of where his remains and any records of my father’s birth records and what happened to my grandfather’s estate that went to probate and his assets was frozen by the US Court of China. My great-grandparents were JMW and Mary Jane Farnham. They landed in Shanghai in 1860 where my grandmother was born the following year. My father was born in 1887 in their home on Bubbling Well Road. Does anyone know where Range Road is in Shanghai, or its current name? S. J. Betines Pharmacy on Bubbling Well Road was my grandfather’s pharmacy. He also owned a photo shop. Grandpa, Grandma, and their five surviving children left Shanghai in stages around mid-to-late 1940s. My mother, Elsie, was the eldest of the five kids. I believe she left on the last ship out of Shanghai in 1949. Grandpa had a brother and three other sisters. Most of us granchildren are here in the US. I have some photos from the Shanghai days. They hosted and attended quite a few parties. So I have photos of lots of smiling faces, from costume parties to birthdays to formals, when the girls received their “key to the city”. I would like to get to Shanghai some day. My mom visited Shanghai with her youngest brother and her sister over 10 years ago. They visited their old home, the Grosvener aparments. It was certainly not the same as it used to be. Someday, I would love to visit Shanghai to find some of the past that lives so strong in us, the grandchildren. My grandfather Hubert Dudley Law ( a cotton merchant) lived on Bubbling Well Road from 1910 -27. He was shot in the head by a Chinese rebel and had a successful operation in the hospital to remove the bullet. He moved back to Hale , Cheshire where he lived till the early sixties. If anyone knew of my family ( the Laws ) please email me at lawjrd@aol.com.. my name is Richard Law..thank you. My father George Edward Rose Carter was born in Shanghai in 1920 along with other siblings. His older brother Claude Randolph James Folipole Carter died 6 March 1929 aged 14. Buried at Bubbling Well Cemetery Grave 65 Section O. My Aunt visited Shanghai many years ago (Claude’s younger sister) but could find no trace of any records unsurprisingly. My grandmother came from Germany and lived in Shanghaii from 1925(?) to 1938(?). Her name was Anne-Laure Soyka and she was a charge nurse at the British hospital. I don’t have any family raining there. She left and went to the Phillipines during WW2. If any one has any info to share, I’d love to hear it! My father was there just after VJ-Day in the fall of 1945. He visited a place that catered to servicemen, called Diana Cafe (at Carter Road and Bubblingwell Road). They had a swing band, and it was near the Roxy Theatre, also on Bubblingwell. A friend of mine’s grandfather was born in Shanghai on March 8, 1935. His family name was Manzarov. Th mother was told twins were born and she heard them cry, but the next day she was told one had died. I am trying to find the hospital records for the hospital. They were from Russia but were in Shanghai when the babies were born. They later emigrated to the United States. Does anyone know where I might find these records? Have tried Ancestry and Family Search with no results. Thank you. My grandfather George Frederick Hutton Potts and his wife Esme lived on Bubbling Well Road from 1906 to about 1914. His 3 sons (my uncles and father) were born on Bubbling Well Road. U flew into Shanghai, from Kunming, in October 1945. We opened a medical supply depot, near a river, in the Honkew district. We had two floors of a fairly small warehouse. Bubbling Well Road was, I believe, within walking district. Anyone have any idea what main roads may have been nearby? I would love to take a short trip, although I am 92 and don’t know whether to risk it. My parents buried their first son, Stanley Edward Lambert in Bubbling Well Rd cemetery in 1937, a few days short of his 4th birthday. Within months, they made a hurried departure from Shanghai during the Japanese attack (Fall of Shanghai). After the cemetery’s closure in 1951, it seems that the remains of foreigners were disinterred including British Customs Officers, however, the families were not informed and there is no information about what happened to the remains of their loved ones. Any information at all would be appreciated. My Grandfather lived at the Foreign YMCA on Bubbling Well Rd 1931-32. He was a pilot for the then new China National Aviation Corporation. Does anyone know if the YMCA building still exists?